In the art of the Middle Ages and Renaissance, the Virtues were often personified by human figures carrying identifying attributes. Faith in this case had a chalice and a cross, now broken. As represented by Mino da Fiesole, a contemporary of Desiderio da Settignano and Antonio Rossellino, Faith and a companion piece Charity appear as slender young girls in clinging, layered gowns with fine pleats. Their heavy mantles are carved in distinctive, angular folds. Typical of Mino's style is the fine, precise, sharp-edged treatment of textile folds and locks of hair, giving these features an ornamental quality different from the softer approach of Desiderio and Antonio Rossellino. Purchased 1864 by Charles Timbal [1821-1880], Paris; sold 1872 with his collection by Gustave Dreyfus [1837-1914], Paris; his estate; purchased 1930 with the entire Dreyfus collection by (Duveen Brothers, Inc., London, New York, and Paris); purchased 15 December 1936 by The A.W. Mellon Educational and Charitable Trust, Pittsburgh; gift 1937 to NGA. Preliminary Catalogue of Paintings and Sculpture. National Gallery of Art, Washington, 1941: 228, no. A-7. Duveen Brothers, Inc. Duveen Sculpture in Public Collections of America: A Catalog Raisonné with illustrations of Italian Renaissance Sculptures by the Great Masters which have passed through the House of Duveen. New York, 1944: figs. 122-124. Paintings and Sculpture from the Mellon Collection. National Gallery of Art, Washington, 1949 (reprinted 1953 and 1958): 157, repro. Seymour, Charles. 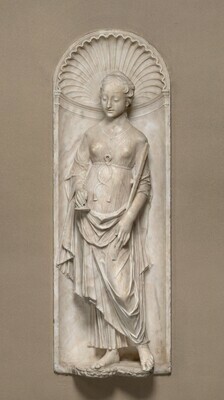 Masterpieces of Sculpture from the National Gallery of Art. Washington and New York, 1949: 177, note 28, repro. 98, 99, 101. Walker, John. National Gallery of Art, Washington. Rev. ed. New York, 1984: 624, no. 964, repro. Moskowitz, Anita F. Forging Authenticity: Bastianini and the Neo-Renaissance in Nineteenth-Century Florence. Florence, 2013: 53, fig. 30 (detail).